Not much has changed with the taskbar in Windows 8, you’ll still be able to use it the way you’re used to in Windows 7. Many Windows users just use the taskbar and give little thought to the way they can customize and use it. We’ll show you how to get the most out of the taskbar without the familiar Start Menu you were used to in previous versions of Windows. The Windows taskbar gives you access to a variety of programs and options you can quickly open without having to head to open things manually. You can pin programs to the taskbar, just like you can to the Start screen in Windows 8, and you can also control how the taskbar looks, is located and what icons show up in the notifications area. 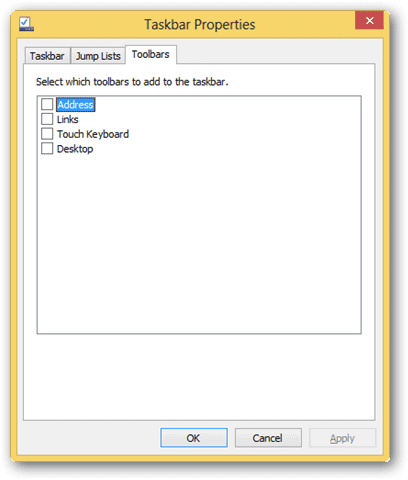 This will open a menu that can allow you to add additional toolbars to the Windows 8 taskbar. You’ll have the option to add a search bar, links, additional inputs, such as an the on-board keyboard and even a quick link to the desktop. You can even create your own “toolbars” for the Windows 8 taskbar. 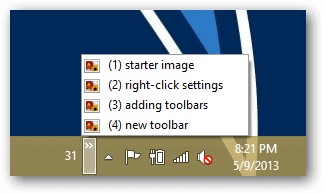 All you need to do is check the toolbar you want to add to the taskbar, and Windows will add it automatically. You can also create your own toolbar for the Windows 8 taskbar, which can be built from any folder on your PC. Once created, you can then quickly jump to any file, EXE, etc. located within it right from the taskbar. 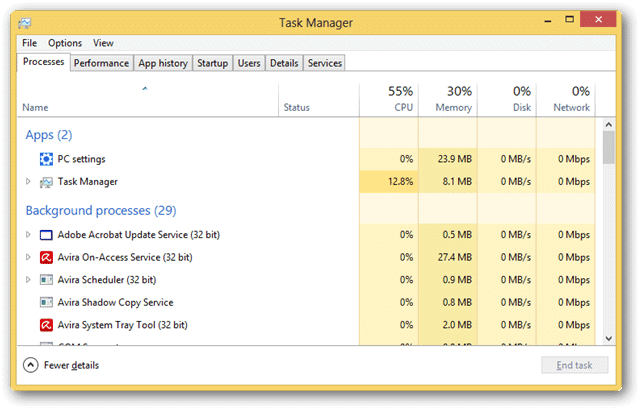 If you right-click the taskbar again, you can open the Task Manager. From here, you can mange how items are running in Windows 8. 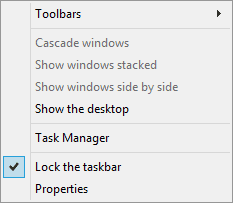 You can edit how the Windows 8 Taskbar Properties work. 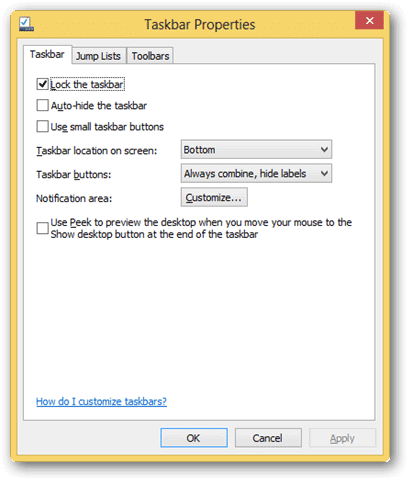 The first tab, Taskbar, allows you to work with how the taskbar itself is utilized in Windows 8. You can lock the taskbar, which keeps it in place. You an auto-hide the taskbar when you’re not hovering over it. You can also use small icons for your taskbar, which can be useful when you utilize a lot of pinned items on the taskbar. 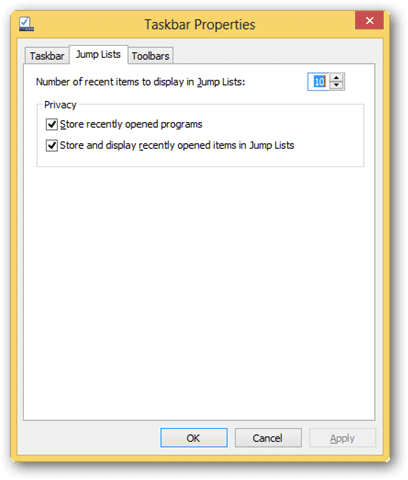 The second tab, Jump Lists, lets you customize the amount of recent items in a jump list as well as whether you store your recently opened programs and items in the jump list. The final tab, Toolbars, allows you to add toolbars similar to the steps we showed you above. 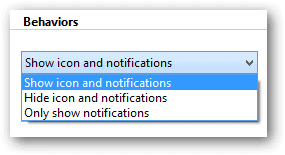 From the taskbar to here, you can now customize the notifications that show up in your taskbar. Under Behaviors for each icon, simply change the settings for how it’s displayed. Your taskbar will show those notifications as you see fit. This will allow you change the behaviors of the default icons, such as Networking, Power, etc. that show up in the Windows 8 taskbar. If you right-click your taskbar in Windows 8 again, and click “Lock the Taskbar,” you can now drag and drop it to either the top, right, left or back to the bottom of your Windows 8 screen. As long as you keep Lock the Taskbar unchecked, you can move the taskbar as you see fit. 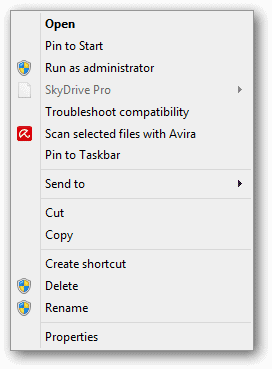 Most program shortcuts in Windows allow you to pin it to the taskbar. This not only gives you a direct way to launch a program, but it also gives you access to jump lists if available which can make using these pinned items even more efficient. In order to pin an item to your taskbar, right-click on a shortcut. Now, that item will appear in your taskbar. When you right-click on it, it’s jump list if available will appear. You can then access additional functions right from the taskbar pin as opposed to opening the program and finding it yourself. What good it the Windows 8 taskbar without the Start Menu? The Windows 8 taskbar is still a viable way to take advantage of desktop-based programs. Even without the Start Menu, and even in Windows 7 where you use it, you can still use the taskbar as a way to launch programs without touching the Start Menu at all. Just because the Start Menu was removed from Windows 8 doesn’t mean you can’t still use the taskbar the way you’re used to.